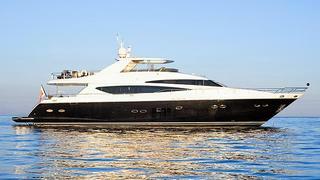 A call to Princess Brokerage International confirms that Adam Essex has closed on the sale of the 30m motor yacht Alexandra V to a direct client. Built by Princess Yachts International in 2009 and refitted in 2012, Alexandra V sleeps eight guests in three doubles and a twin cabin. Boasting a huge interior volume, elegant lines, luxurious fittings and long range cruising capability, she is one of the most advanced models to be built since the company’s inception. The expansive flybridge is an ideal place to entertain, with comfortable seating and sun bathing area, barbecue, wet bar and an electric illuminated bimini cover. Features include twin 2,400hp MTU engines and zero speed stabilisers. Alexandra V was asking £3.25 million.